i made a baby blanket using a basic v-stitch pattern from handcrafting with love – alternating v-stitch afghan #2. this is one of my favorite patterns for an afghan because it is really easy and repetitive – so easy to do mindlessly while watching tv – yet it looks pretty and complex. 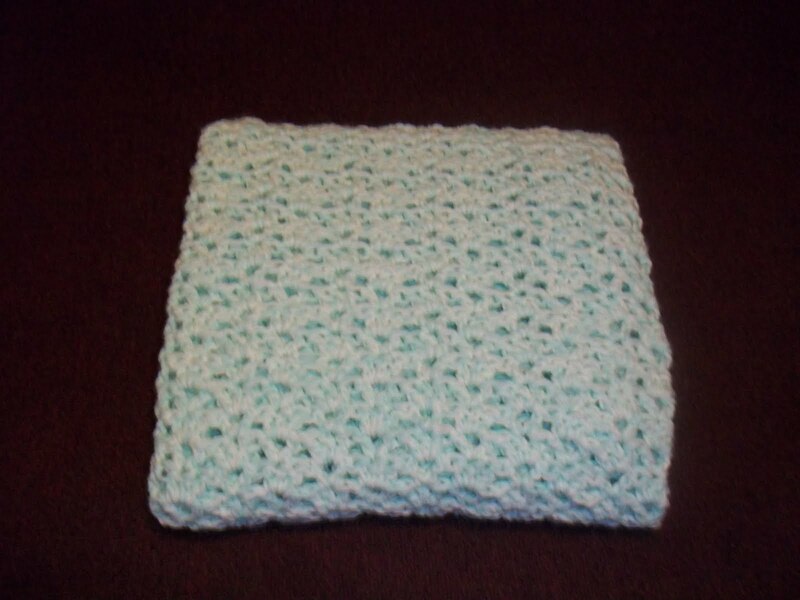 i added a basic half-double crochet border. for some reason i couldn’t get a non-blurry picture, so this is the best i could do of the entire thing stretched out. here is a closer look at the pattern. 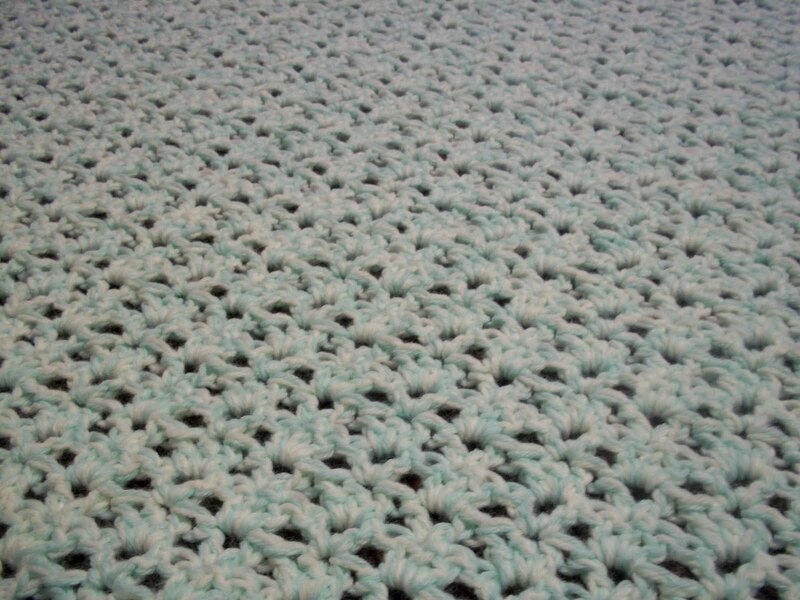 i crocheted this blanket with two strands of pound of love yarn in a light green and ivory color. hopefully, being crochet with two strands will a) keep flopper warm on those cold minnesota nights and b) withstand lots of rambunctious little boy energy! my grandma made me a crochet blankie that i dragged with me everywhere i went for years. it was pretty ragged by the time i was in third or fourth grade! and this is my first crochet baby sweater! i searched and searched for a pattern that was relatively easy but not totally basic, and wasn’t as boxy as a lot of patterns. 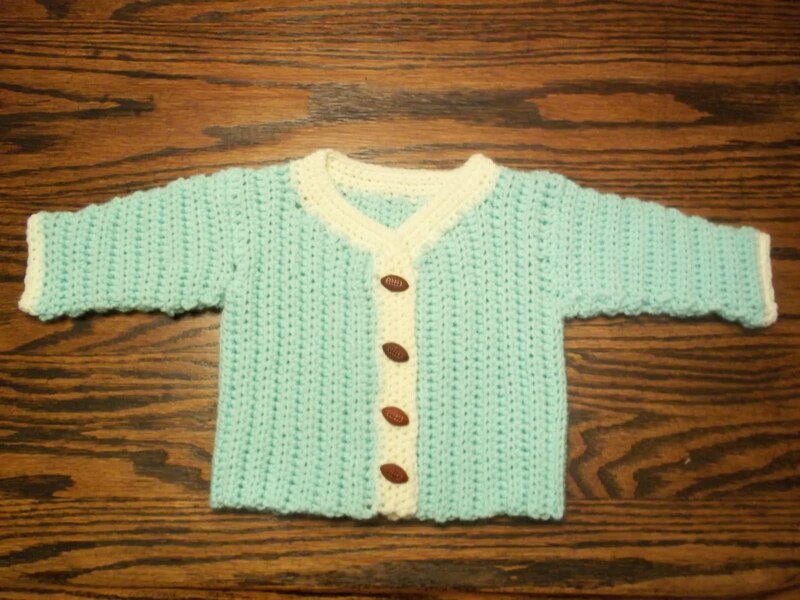 i used the sweater pattern from the coats and clark newborn layette pattern. the adjustments that i made were with the colors (i hate switching colors so i didn’t do the stripes) and the sleeves. the pattern calls for decreasing stitches at the armpit and down the bottom of the sleeve, but it seemed to me that this would make the sleeves go upward…and most babies i know have arms that naturally point downward, not upward! so i did the decrease at the top of the shoulder and along the top of the sleeve, and i’m pleased with the result. it doesn’t make a huge difference, but i think it will make the sleeves fit a little more naturally. i love the football buttons! 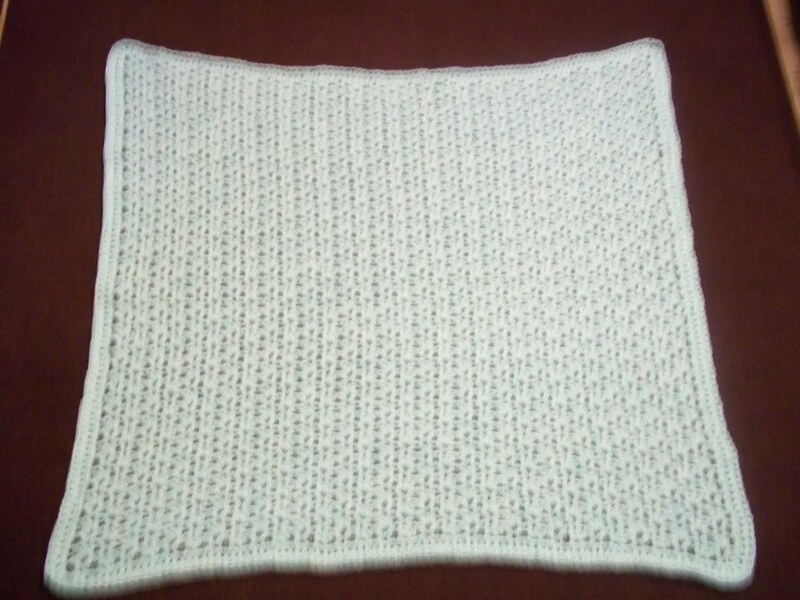 This entry was posted in Crochet and tagged afghan, baby blanket, baby sweater, crochet, sweater. Bookmark the permalink.